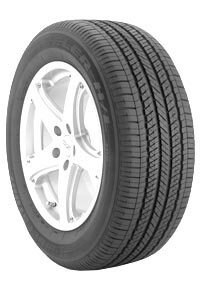 Bridgestone Dueler H/L 400s (225/55 R18) were the OEM tires on my 2015 Subaru Forester. They have lasted 50,000 miles and I have had absolutely no issues with them. They perform fine in wet and snowy conditions. I am about to buy another set of tires and I was surprised to see such negative reviews. Makes me think that I just got lucky and should consider a different tire. These tires are terrible in the wet and useless in the snow. They don't last, either. Replaced OEM tires (BRIDGESTONE DUELER H/L 400) with same in Summer of 2013. With just over 30,000KM on them the tires are worn out. These tires were rotated regularly and alignment checked (my brother-in-law owns his own shop). I'd steer clear of these tires. I'm currently looking at replacing them with another brand. It doesn't snow in this area, so not applicable. This is my second set of Bridgestone Duelers, and I am very pleased with them. No warranty. Disappointing that Bridgestone does not back this product up. I have been a customer of this shop for years. I purchased a used vehicle 2012. I have always gotten good advice/service from the guys at the shop. They told me that my tires were starting to show dry rot in May of 2013. The vehicle was purchased with 32k miles on it. They recommended the Ecopia tires but they were on back order all over the country when I wanted to get them,in December 2013. Then they recommended the Hankook which were already on the vehicle. I shopped around before I bought the tires and the price I got from them was very comparable to other shops. I am happy with the Hankook tires which were recommended. The tires are on my wife's truck which she uses to transport herself and our 1yr old daughter. She has had not problem with them. I will continue shopping with this shop because the service and staff are first rate. I have owned my Sorento since new. These new Bridgestone tires out perform the original factory tires. I am in love with my car again. Thanks! My new Honda CRV came equipped with Bridgestone Dueler H/L 400 tires. At ten thousand Kilometers/ 6 thousand miles after rotating tires, the vehicle steered to the right. Honda was not responsible for the warranty but checked the tires and said there was nothing wrong with the tires safety wise but rotated them back to original position. After driving 20,000 Kl/ 12,000 miles, the tires now make a thumping sound when driving down the highway. Had them balanced, and no change in the thumping sound. Replaced all four tires with another product. Vehicle now drives smooth as silk. These tires were bad from the get go. Would never buy again or recommend them to anyone.